Degeneration which is the process in which the structure (bone) is altered. The bone increases in size which can impede on structures such as nerves causing pain either on one side or in some cases both sides. Also, the bones may touch each other which would produce pain through rubbing and inflammation. 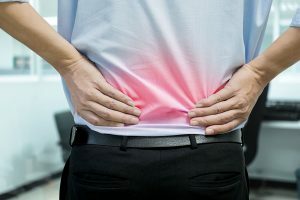 Disc degeneration or herniation: In disc degeneration, the cushion of the spine loses its “spring” to absorb force and can lead to either a disc herniation that can press on a nerve causing pain. The disc can have a tear in it that produces pain itself. Muscles strains: One of the most common forms of pain in the lower back. The muscles are the shock absorbers of the lower back. If the muscles are weak, they cannot handle the forces that are placed upon them and small micro tears can occur or in move sever causes a major tear. In all 3 cases, the number one defense against either having these problems or progression is to have a strong core to withstand the forces of daily life.